Conifers are predominantly evergreen trees and shrubs, some of which can be propagated from softwood, greenwood, semi-ripe and ripewood cuttings. 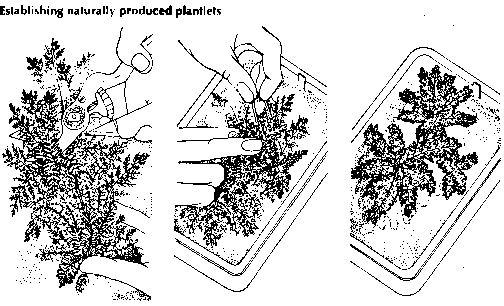 In general, spruces, firs and pines do not respond to propagation from cuttings, and they should be propagated from seed or, if special varieties are required, by grafting. Whether conifer cuttings are to be propagated in a warm environment, such as a closed case, or in a colder one, such as a cold frame, does not affect the season that they are taken. Take cypress cuttings in autumn or winter, and yew and juniper cuttings in the new year after the parent plants have been subjected to a period of frost. Select cuttings from young, actively growing plants such as hedges that are clipped regularly, and so produce strong, vigorous shoots. 1 Fill a container with some cuttings compost. Firm to within 4 in of the rim. 2 Cut off a vigorous leader or lateral shoot about i in into the brown-barked wood. 3 Trim the leaves off the bottom 1-1J in of the cutting. Dip the basal cut in rooting hormone. 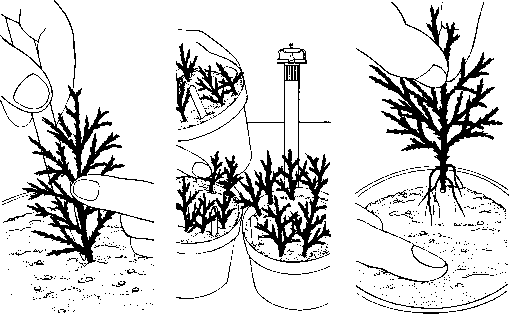 Preferably take cuttings from the top rather than the bottom of the plant, as cuttings from low down often develop into plants of atypical habit in that they may continue to grow horizontally. Conifers vary considerably in their pattern of growth. 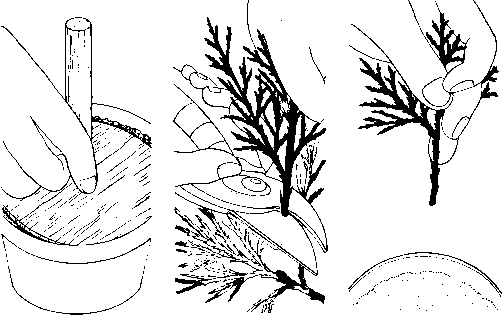 There are leader shoots, which are the growing points of the branches; lateral or sub-terminal shoots, which also increase in size; and feather shoots, which do not grow larger. 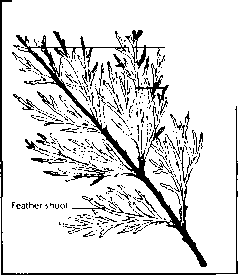 For propagation by cuttings it is important to choose shoots with a distinct growing point, and this is why feather shoots are unsatisfactory. If a growing point is not present, bun-shaped forms will be produced, particularly with yellow foliage forms. Conifer cuttings to be propagated in the warm environment of a closed case or mist unit should have a softer base than those to be propagated in a cold frame; they should also become established more quickly. 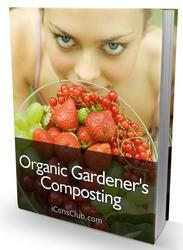 Fill a container with cuttings compost and firm to within f in of the rim. The tip of a conifer shoot is green; it gradually turns yellow further down the stem, and then brown. Remove a vigorously growing leader or lateral shoot from the parent stem. Make a clean cut about £ in into the brown-barked wood so that the cutting is predominantly green but has a small protective "plug" of hard wood at its base. Trim the leaves off the bottom in of the cutting. Do not remove the growing point. Dip the cutting in a rooting hormone powder of ripewood (0.8 per cent iba) strength. 4 Make a 1 in hole with a dibber. Insert the cutting and firm. Plant any other cuttings 1^-2 in apart. 5 Label them. Then water with a fine rose. Place the container in a closed case or mist unit. 6 Harden off the cuttings once they have rooted. Pot on in spring. Label them. How to grow conifers from cuttings? Can you take a cutting from a conifer? What plants propergated rooting hormone powder? How to grow conifers hormone powder? How to propagate juniper from cuttings? How often mist conifer seeds?